Betel nuts are small in size and are round to oblong in shape. The fleshy outer husk is coarse and matures from green to yellow-orange and may also contain patches of red. Within the husk, there are layers of fibrous pale yellow strands surrounding a hard light brown seed or nut, which is the dried endosperm. When the husk is green and immature, the nut and surrounding fibers are soft, but when the fruit matures, and the husk turns orange-yellow, the nut and fibers become hard, wood-like, and firm. Betel nuts offer a chewy texture with a spice-like flavor similar to nutmeg and cinnamon. Betel nuts are available year-round in tropical and sub-tropical climates. Betel nuts are the seeds of fruit growing on a palm botanically classified as Areca catechu and are also members of the Arecaceae or palm family. 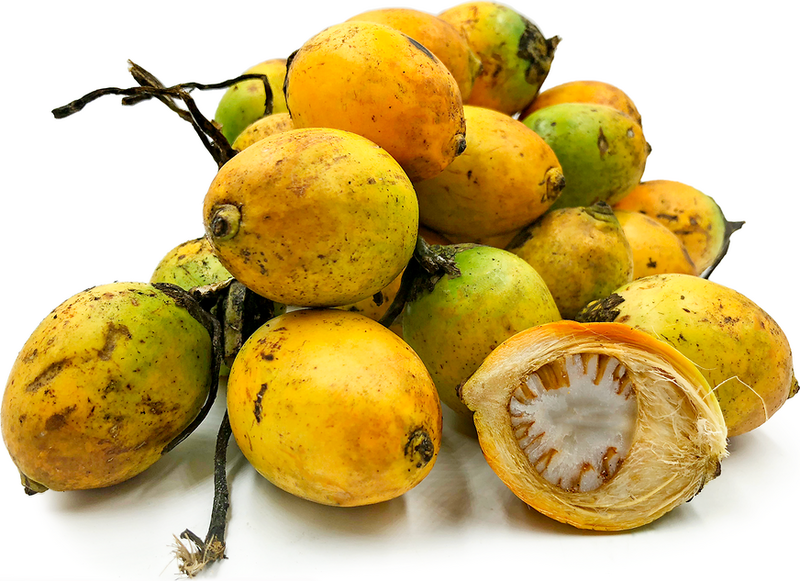 Also known as Areca nuts, Betel nuts are chewed as a stimulant in India, the West Indies, and Malaysia. Betel nuts contain arecoline, a stimulant that produces effects such as alertness, increased stamina, and a feeling of euphoria. The Betel nut is used in the same fashion as caffeine or tobacco in Western countries and can be found in fresh, cured, or dried forms. Betel nuts contain some fiber, calcium, and iron. Betel nuts are best suited for raw or dried applications and can also be roasted, cured, boiled, or baked. They are often chewed either on their own or in paan, which is considered an ancient breath freshener as well as a stimulant. To make paan, Betel nuts are grated or cut into fourths and wrapped in betel leaves or the Piper betel plant along with mint jellies, sweet Betel nut chutneys, lime paste, and fennel. Some smaller, possibly immature, Betel nuts can be wrapped in a small folded leaf and chewed for prolonged hours. When dried, Betel nuts have a long shelf life and will last for a couple of months when stored in a cool and dry location. In Ayurvedic medicine, Betel nuts in mild dosages are believed to help with dry mouth, cavities, gum infection, and indigestion. Ayurveda is a 5,000-year-old system of natural healing that has its origins in the Vedic culture of India. It is a system offering a unique approach to health care in the form of self-discovery through natural organic substances sourced directly from nature. Chewing Betel nuts is largely a part of many Asian cultures and is considered an important cultural practice in select regions of Southeast Asia. While it has been a long-standing practice, there is some debate over the health related issues caused by consuming the nut. Some experts believe that excessive use of the nut has proven cases of mouth cancer, gum cancer, lowering the blood pressure, and forming a lifelong addiction. In-depth research should be done before consuming Betel nut. Betel nuts are native to the West Indies, and archaeologists have found evidence of Betel nut use over 4000 years ago. They were then spread to Europe, Asia, and the rest of the world in the 16th century via Portuguese and Dutch sailors. Today, Betel nuts are cultivated in regions of Japan, China, India, Sri Lanka, Bangladesh, Philippines, Africa, and East Indies and can be found at local markets. Recipes that include Betel Nut. One is easiest, three is harder.